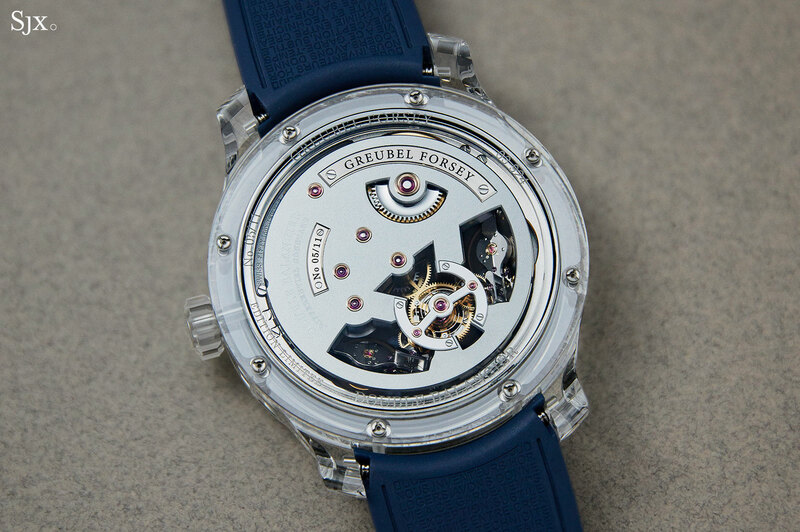 Only the second Greubel Forsey wristwatch in a sapphire crystal case, after the Double Tourbillon of 2016, the Double Balancier Sapphire is mechanically identical to the Double Balancier à Différentiel Constant, essentially an exceptionally decorated, nerdy movement inside a watch case that is made of the material du jour. 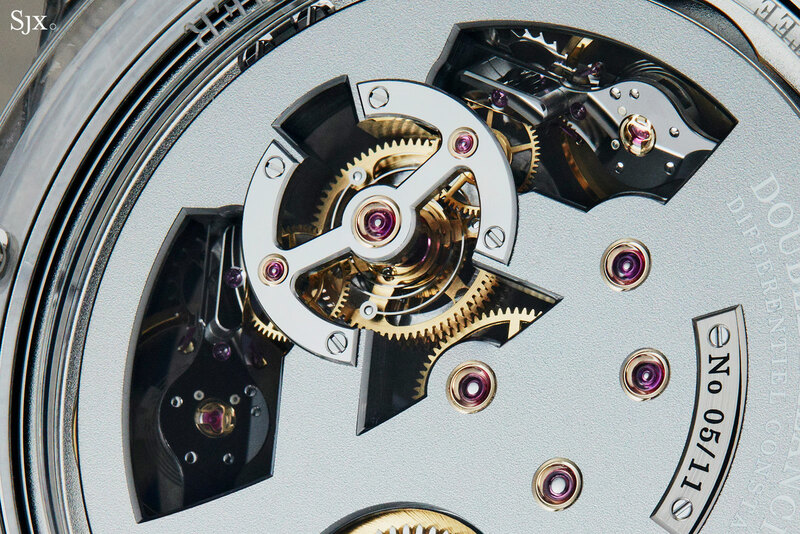 That means the watch is equipped with twin balance wheels, both installed at a slight incline. Because of their position, each balance wheel is always in different but complementary position relative to the other. The rate of each balance wheel, in turn, is averaged out by the differential that links the two; in short, they compensate for each other’s position errors. 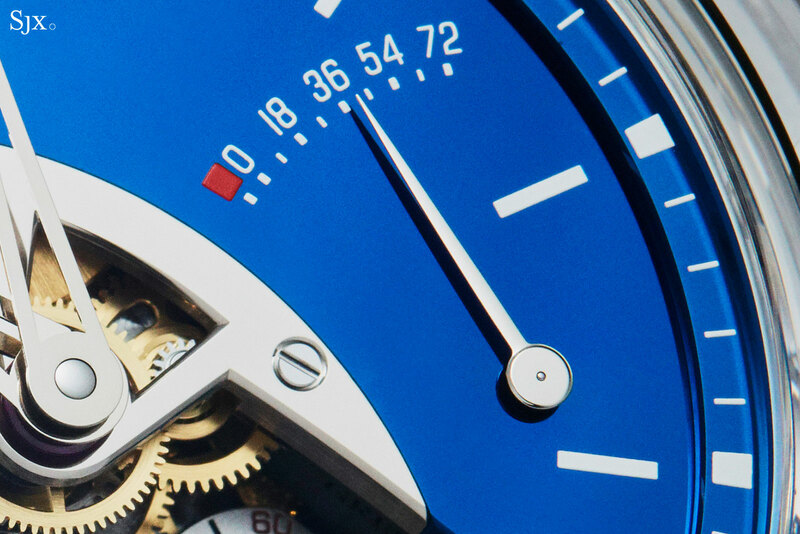 Consequently, the time displayed on the dial is an average of the two complementary balance wheels, which promises better timekeeping than a single balance wheel. Half the dial has been cut away to reveal the twin balance wheels, each held in place by a polished, rounded steel bridge. In between the two sits the differential, which is basically a stack of gears and springs. It’s held in place by a H-shaped bridge with a kink in the bridge of the “H”, mirrored on the back by an similarly shaped bridge. The reason for the springs in the differential set-up – one spring is visible on the front, and the other on the back – is to provide a constant tension to each of the differential gears, preventing them from slipping. In short, it’s akin to a limited-slip differential as one would find in an automobile. 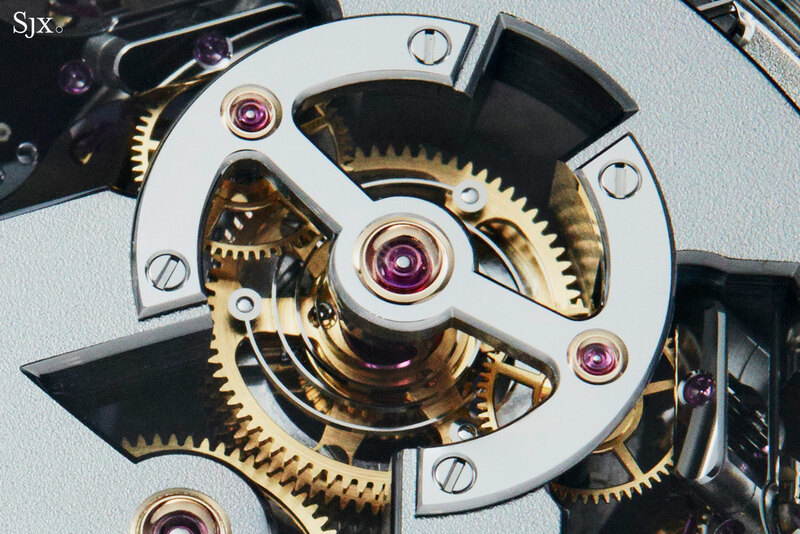 Each gear is in turn linked to one of the escapements, and together they average out the rate of both escapements. 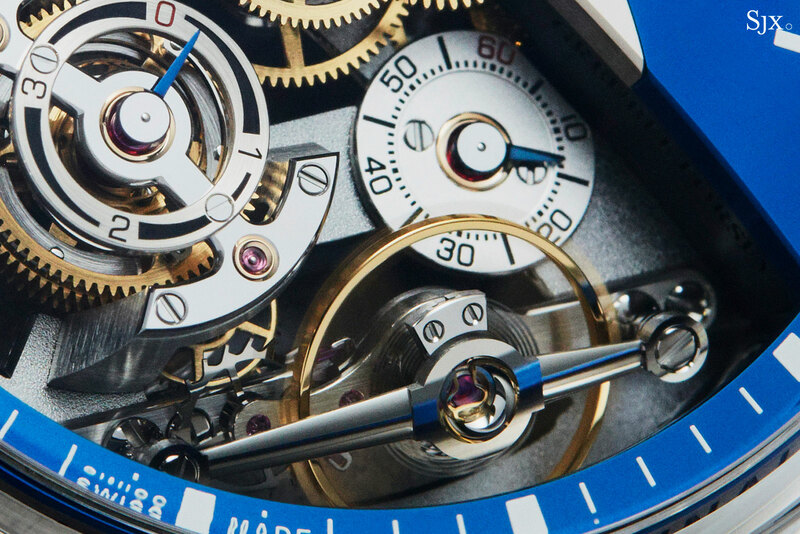 Even though the mechanics on the front are impressive, so is the brilliant blue dial. It’s made of mirror polished solid gold that’s been chemically blued, creating a glossy, almost luminous blue. The hue of the dial is so striking it’s almost a shame to have so little of it, but fortunately Greubel Forsey offers other models with an identical dial finish over a larger area. Everything on the front is lavishly finished and executed, as is typical of Greubel Forsey. Beyond the dial, the hands are also solid 18k white gold, with their pinion sitting on a black polished and lovingly bevelling steel bridge. All of the wheels are circular grained with polished spokes, the screw heads are mirror polished and enhanced by chamfered slots and rims, and jewels sit in gold chatons. The list of decoration goes on. The same can be said for the back, which is dominated by a full plate finished with a pale grey ruthenium coating on its frosted top surface. Though the colour of the plate is restrained, the finishing is elaborate. Even the underside of the lower bridges for the balance wheels are mirror polished. 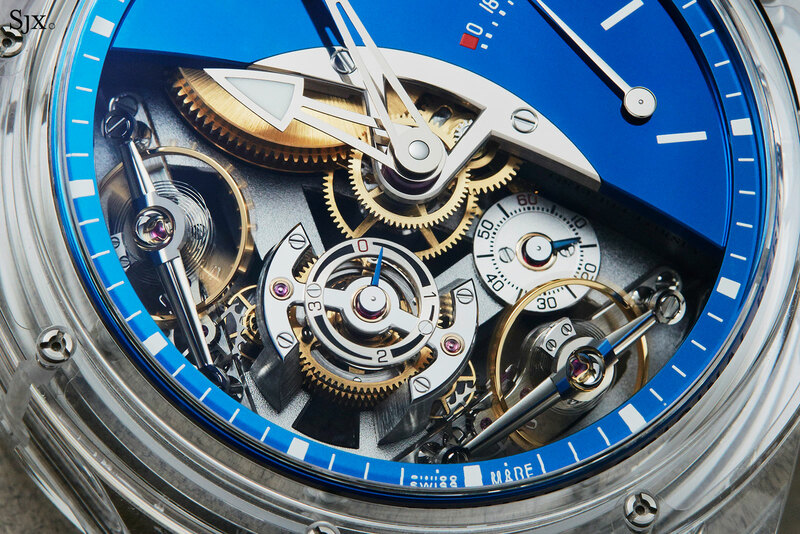 Made in Switzerland (many sapphire cases used by Swiss watch brands are ironically not) and the result of 900 hours of machining, the sapphire case is huge at 47.25mm in diameter, compared to just 43mm for the gold version of the watch. 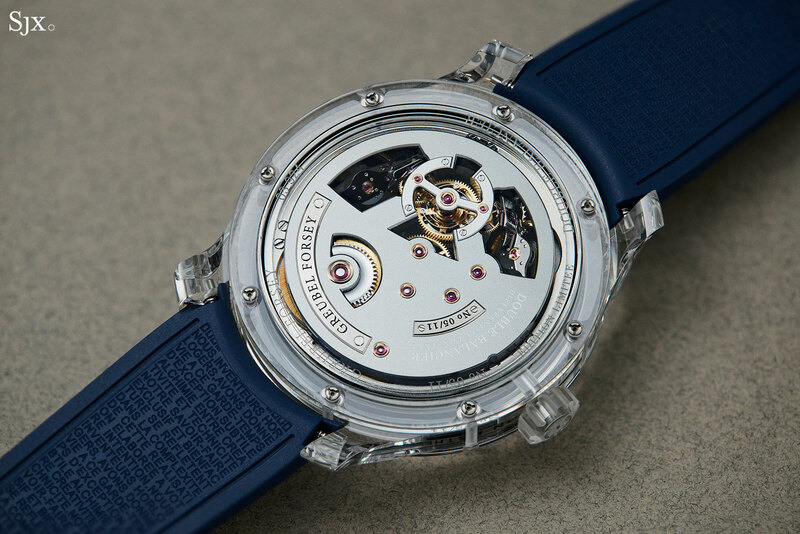 The increase in diameter is due to the changed construction of the case, which is essentially a sandwich secured together by long screws that extend from the bezel to the case back. All the screw heads and nuts are visible on the front and back, along with the clear gaskets that ensure water-resistance of 30m. Although an extra 4mm sounds like a huge increase in size, the sapphire case doesn’t feel significantly larger, in part due to the transparency of the case. And because the ratio of the diameter to the height is now greater, it feels thinner, which helps the case feel smaller. The case also feels slightly lighter than the typical precious metal Greubel Forsey, which is not a bad thing since they tend to be heavy. Unusually, the crown is also made of clear sapphire. 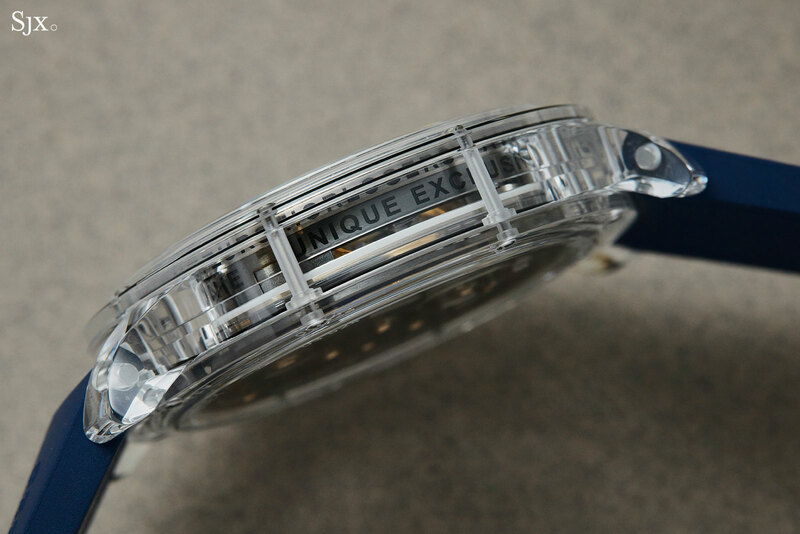 Most sapphire case watches have metal crowns, which are significantly easier and cheaper to produce. Despite the new case construction, the form of the case is identical to the typical Greubel Forsey. It’s most evident in the lugs, which retain the same gently concave flanks found on the brand’s ordinary cases. Consequently the case is not as extravagant as most sapphire watch cases are, since they are typically found on watches with unusual case shapes, like the Hublot MP-07 for instance. 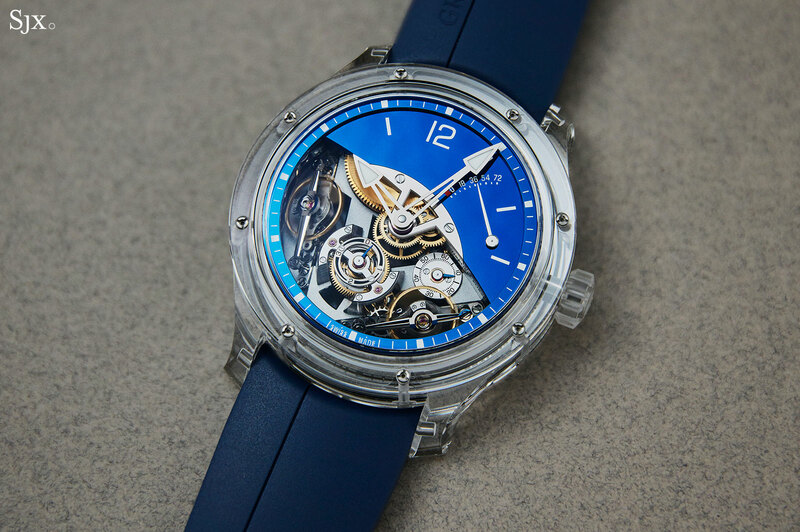 Instead, contribution of the sapphire case is to frame and elevate the movement. 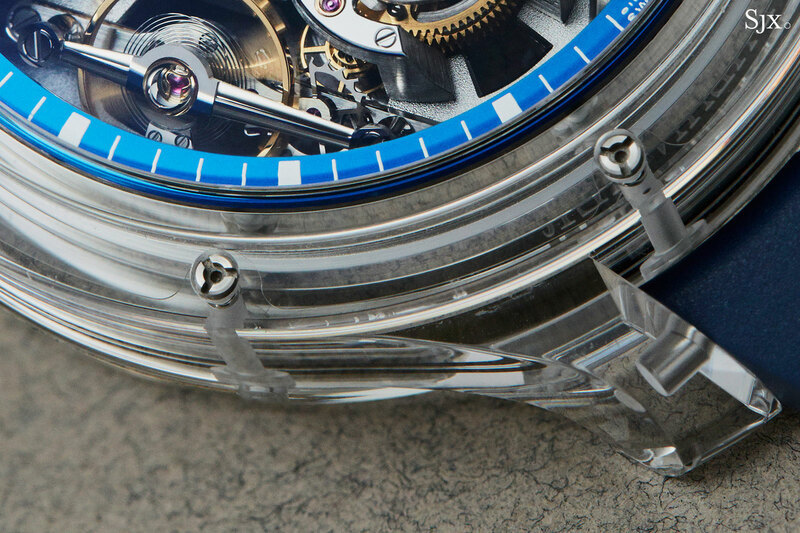 Its transparency means the case recedes visually, bringing out the striking blue of the dial, and also the frosted plate and details on the back. 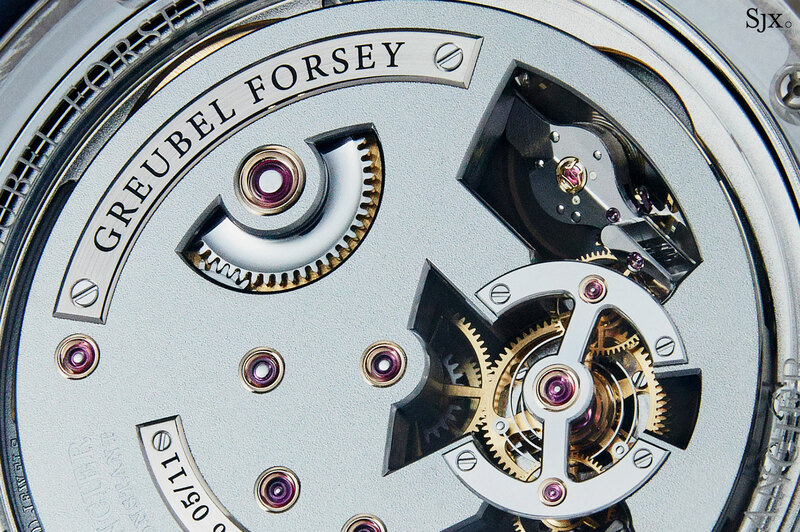 Because Greubel Forsey movements are constructed fairly traditionally, not much of the mechanics are visible from the side of the clear watch case. 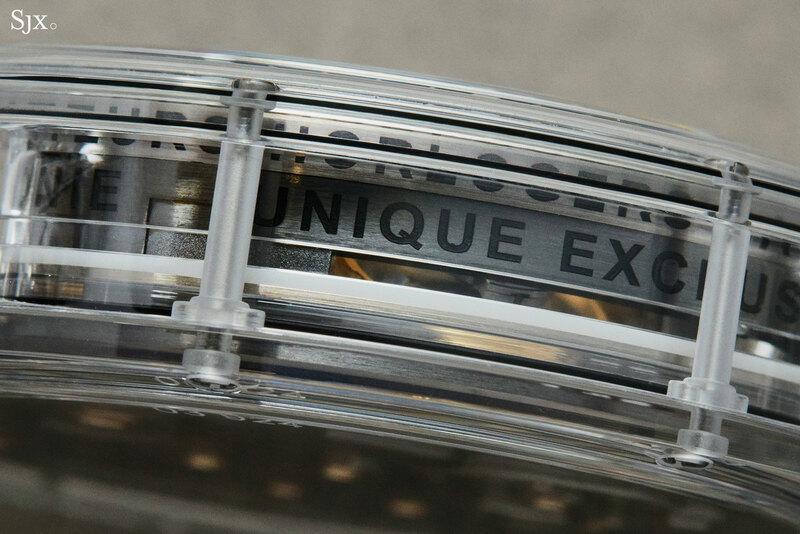 Consequently the movement sits in a ring that finished with a linear brushing, then engraved with the brand’s principles, like “unique” and “exclusive”. A lengthier description of Greubel Forsey’s philosophy is moulded into the reverse of its rubber strap. While the rubber strap is practical, and the de rigueur choice for sapphire case watches, it feels a little incongruent with the movement. Priced at a hair under US$700,000, the Double Balancier Sapphire is almost double the price of the gold version of the same. While the premium seems absurd in itself, it’s pretty much the benchmark for sapphire watch cases amongst the topmost tier of watchmakers. And given that Greubel Forsey has used sapphire cases sparingly in its line-up, the material still has novelty. Especially since Greubel Forsey is a more traditional haute horlogerie watchmaker, in contrast to the contemporary watchmaking favoured by other brands that favour sapphire cases. 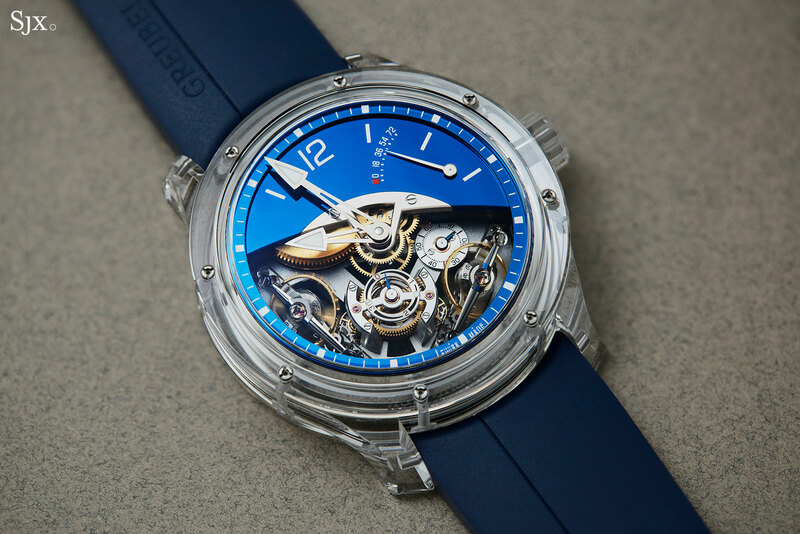 The Double Balancier Sapphire is a limited edition of 11 watches, priced at US$695,000. Correction January 15, 2019: The watch features a limited-slip differential, and not a remontoir d’egalite as stated in an earlier version of the article. Officially the Greubel Forsey Double Balancier 35° is the first GF watch without a tourbillon, though the brand did quietly create an edition of six double, superimposed balance wheel watches for London retailer Marcus last year. 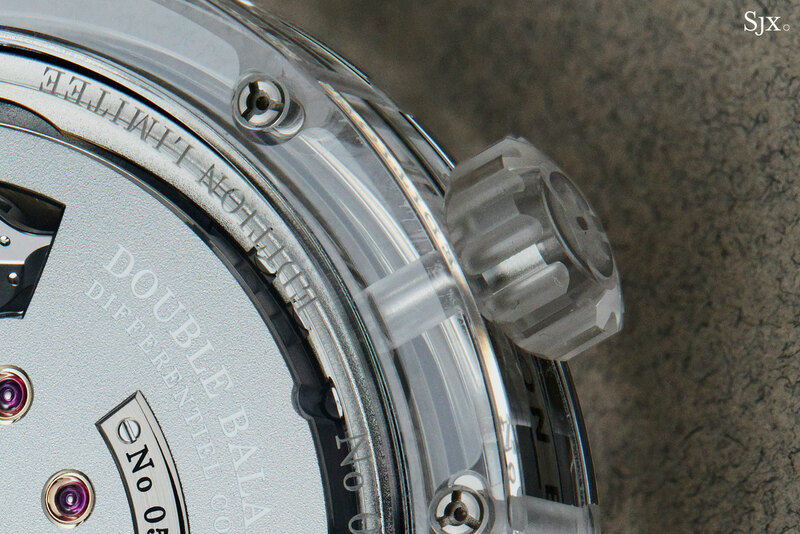 Though similar in principle to the Marcus watch, the Double Balancier 35° uses a different movement. Continuing its vertical integration in watch manufacturing, Chanel has just announced its 20% stake in Kenissi, a recently formed watch movement and component manufacturer, which it acquired for SFr20m in March 2018 according to Reuters, around the same time Chanel took a stake in F.P. Journe. Chanel’s announcement also stated that the first wristwatch equipped with an automatic Kenissi movement will be launched at Baselworld 2019 in March. 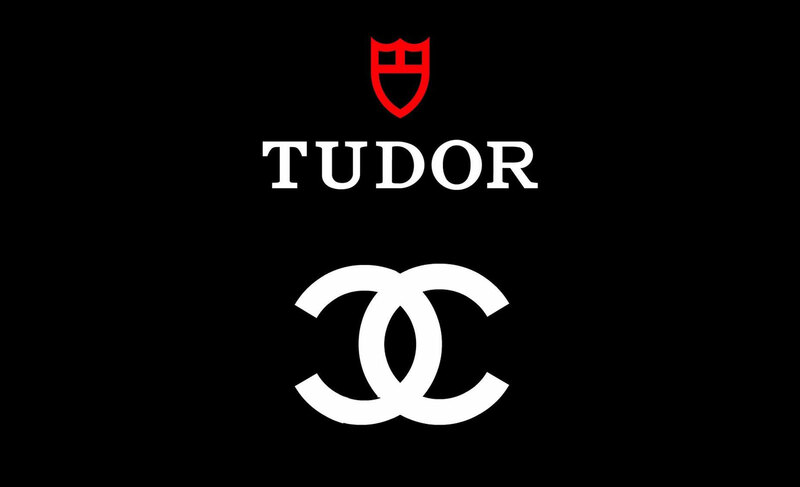 More intriguing are Chanel’s partners in the project. Swiss newspaper Le Temps writes that Kenissi is the “industrial arm of Tudor”. Though Kenissi is now based in Geneva, it will move to a new facility in Le Locle in 2021, where a factory about 150m long – nicknamed “Project Gemini” – is now under construction. Half the building will be for Kenissi, and the other half for Tudor, according to Le Temps. That is confirmed by Swiss business registration records, with one of the directors of Kenissi Holding SA being Eric Yvon Pirson, chief of Tudor. And another director of the Kenissi is Jean-Paul Girardin, who was essentially running Breitling until private equity firm CVC took it over. Le Temps names Mr Girardin as the man who will be running the new Le Locle factory. 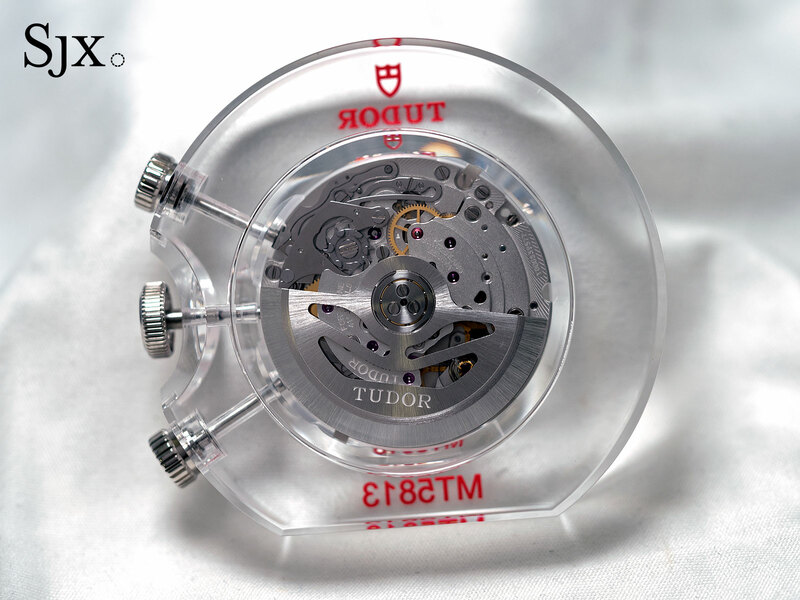 That is perhaps unsurprisingly since Tudor and Breitling have been supplying each other with movements in recent years; the chronograph movement Breitling produces for Tudor is pictured above. Le Temps adds that the majority shareholder of Kenissi is a “mysterious industrialist” who produces sapphire crystals for many large watch brands. According to records, the third and final director of Kenissi is Philippe Jacques Dalloz, who is also a director of several industrial companies specialised in production and finishing of various watch components, including sapphire crystals.